Author: Kaniye S.A. Ebeku. Series edited by: Gesellschaft für afrikanisches Recht / African Law Association (Germany). 18 pp. Roman, 368 pp. 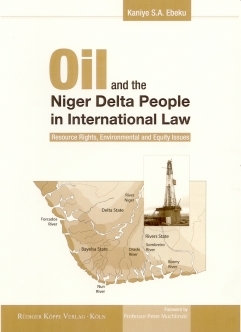 Oil and the Niger Delta People in International Law is about oil extraction in the Niger Delta region of Nigeria (inhabited by the Niger Delta indigenous people) and the associated environmental and equity issues. Nigeria is the leading oil-producing country in Africa, and given the global importance of its oil, it is important to ensure that oil production in the country, which has recently been enmeshed in various kinds of protests by the inhabitants of the region where oil operations are taking place (often resulting in significant reduction of the quantity / barrels of oil produced), goes on unimpeded. Although much has already been written on the subject, this book is unique as it provides a new perspective in the study of the issues involved. Specifically, it examines the issues from the perspective of the rights of indigenous people in international law, thereby engaging the problems raised by the oil-related protests as never before, and makes extensive suggestions towards ensuring peace in the region. Moreover, it is an original contribution to scholarship, which allows us to consider, in a more enlightened manner, the rights of indigenous peoples faced with the effects of international investment projects upon their lives. Historical account of the birth of Nigeria. Status of the Niger Delta people in Nigeria. Discovery of oil in Nigeria. The place of oil in the Nigerian economy. Impact of oil operations on the Niger Delta and the people. Oil companies and protection of the Niger Delta environment. Enforcement of environmental protection laws in Nigeria. Oil operations and equity issues: participation; compensation; employment. The future of the Niger Delta people. Dr Kaniye S.A. Ebeku, LL.B, LL.M (LSE, London), PhD (Kent), is Professor at the Faculty of Law, University of Calabar, Nigeria.